How to Prep for Your Summer Backyard Parties! With the forecast rapidly approaching 90 degrees, it's time to wipe down the patio furniture, and get that backyard ready for its big debut. Every year, I look forward to spending Fourth of July with family and friends. This celebratory American weekend is a magical time to soak up sunshine and the Cape’s saltwater air. 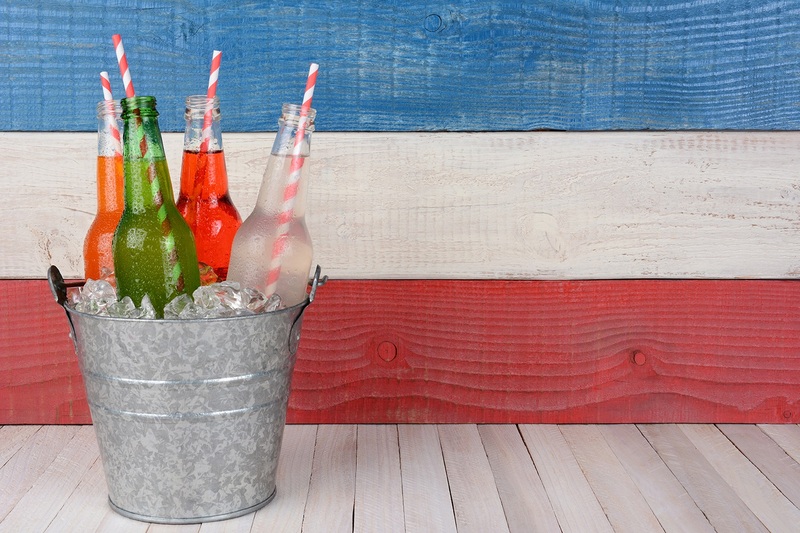 If your party is itching for a little patriotic zest, here are a few tips to prep your backyard for a Fourth of July that guests will be talking about for weeks. Heading somewhere else for the 4th? Use these tips for your other summer festivities! STRING LIGHTS & TIKI TORCHES - Lighting goes a long way. As night begins to fall, string lighting will create radiance and romance that will set the tone for a relaxed evening. The tiki torches will not only be a stunning backdrop, but will also help keep the bugs away at dusk. Not to mention, they are only $3.98/each at Home Depot!! BANNERS – Red, White, and Blue banners are an easy DIY project that can be fun to create and are inexpensive. Brit + Co gave an adorable tutorial for banners here! Don’t have time to create them? Pottery Barn sells patriotic burlap banners too. BURLAP TABLE RUNNERS & TABLECLOTHS – Burlap is a popular material that can be used for consistency and flow through the party. I love to use this fabric because it can be reused for any occasion (and goes with any theme). NAUTICAL THROW PILLOWS – Like I said, I’m a fan of being able to create a theme with decor I will utilize the entire season. Adding outdoor pillows, such as this Hampton Bay Pillow, is an amazing way to spice up the backyard vibe. I cannot BELIEVE this particular pillow is only $10.00! FESTIVE FOOD & DRINK DISPLAYS – Have a old wagon, carton, or wheelbarrow? Instead of a cooler, use that to display your drinks over ice. It'll be an unexpected touch that accompanies the summer motif. Don’t forget to lay out great tablecloths, tiered food displays (here is an amazing Galvanized Display that I can't get enough of from Pottery Barn) and accessorize your tables with a flower arrangement or two; small arrangements make a bold impact too. FLOWERS GALORE – I recently took a pit stop at Shakespeare’s Garden, located in Brookfield, which is a destination that inspires creativity and allows you to experience a moment as Alice in Wonderland. By adding flowers to your backyard BBQ, your guest's senses to be brightened with the energizing aroma of summer. BACKYARD GAMES – Don’t forget games! In fact, Amazon sells croquet for only $60.99. This is a great game for larger yards since multiple people can play at once. OUTDOOR MUSIC – This may require some advance planning, but the most important part to any backyard BBQ is singing along to Kenny Chesney’s “Somewhere on a Beach” right?! POP-UP CANOPY – If there is not a lot of shade in your backyard, why not set up a spot for a canopy? This will be the best location for your food table and a few chairs, allowing guests to slip into the shade. Also, it provides a location to hang additional string lights! The most important part, the American Flag! – A no brainer! Happy Fourth! They say the love is in the details; so have fun, and don’t forget prep your food a day early! Pre-planning has always been my secret to hosting a party that I can kick back and enjoy! Comment and let me know your favorite 4th of July traditions! Don't forget to subscribe and like our facebook page for a free giveaway. LIKE OUR FACEBOOK PAGE & BE ENTERED TO RECEIVE A FREE GIVEAWAY!